I've written entertainment articles, listicles, campaign pieces, company announcements, and the food-related pieces you might have seen on this site. Below are samplings of projects I've authored both at Wikia, issuu, and KQED. When PBS launched their The Great American Read campaign, each department was asked to participate, so I put together a piece for the KQED Food team pairing certain TGAR novels with a dish that tied into the story. This piece broke down the first teaser trailer released for 'Fantastic Beasts' in December 2015. Celebrating 'Empire' returning to the small screen, I collected 10 moments where fan favourite Cookie Lyons proved herself to be a boss. Part of our programming at Fandom involved "crash course" pieces that gave recaps to catch fans up with a show or movie property before the next part of the series was released. I researched and wrote the script for this 'Orphan Black' Crash Course video and article. Part of my blog strategy was to keep our content up to date with seasonal and timely offerings. 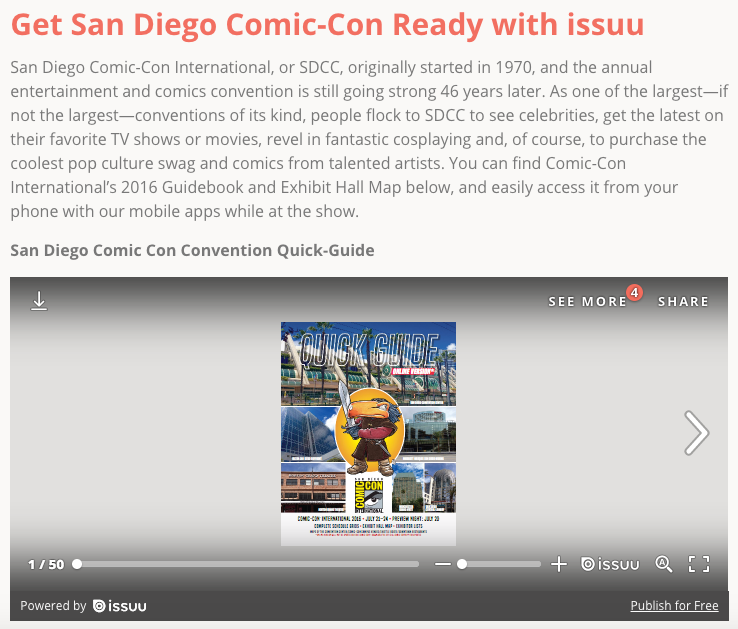 With SDCC coming up, I wrote this piece for attendees and fans of the convention filled with information and interesting publications found on issuu. After attending the Brit + Co Re:Make Festival, I summarized the day and key takeaways for our #issuumakers. As Community Manager at issuu, I led the creation and launch of their Community Hub. Part of the launch involved email, social, and blog announcements.